Summary : The tea is a combination of peppermint and spearmint flavors. Unlike loose leaf teas, this creation from Bigelow has a surprisingly weak taste - and the mint flavor is, well, unique. Review : Have I mentioned yet how much I love mint? Spearmint, peppermint - you name it - and I love it. I'll try basically anything that contains mint in it at least once. And so I was quite pleased when I stumbled across a Bigelow Mixed Tea Sampler box that contained a tea called "Mint Medly", which is a blend of peppermint and spearmint. For a person who loves mint, such a combination seemed to be to good to true. And so it was with those happy thoughts that I set out to taste this potentially wonderful tea. Like all Bigelow bagged teas that are part of a mixed sampler, each tea bag is individually wrapped in foil. This is a good thing - since it both keeps the tea fresh as well as preventing the other tea flavors in the box from contanimating each other. Upon opening the foil for the Mint Medley tea, I was quite pleased with the aroma. It did indeed smell a bit of both peppermint and spearmint. The aroma wasn't nearly as strong as say loose-leaf peppermint or loose-leaf spearmint, but it still had a nice aroma about it. This aroma, no doubt, was due to the ingredients in the tea. 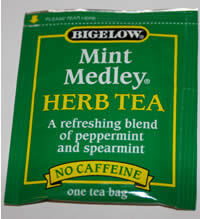 Bigelow's Mint Medley Tea consists of peppermint leaves, spearmint leaves, rose hips, lemon peel and hibiscus flowers. The tea is also caffeine free, too. Yet, upon tasting this tea, I was disappointed. Keep in mind, I have a sweet tooth. And as such, when I taste a mint tea - I like it strong. This is why I so much liked the Stash Peppermint Tea, Adagio's Peppermint Herbal Tea and Culinary Tea's Spearmint Tea - all these teas have strong, mint flavors. By contrast, this Mint Medley tea had a rather weak taste. Yes, you could taste some mint in it - although you really couldn't seperate the spearmint from the peppermint. Instead, the combination of the mint leaves produced a completely different type of mint taste - something I never tasted before. And really don't want to again. Overall, if you like strong spearmint or peppermint teas - particularly those found in the loose leaf variety, I would recommend staying away from this tea as it will disappoint you. However, if you are looking for a "completely new" mint taste - and like the strength of your teas on the weak side, I would try out this tea. Like the tea advertises, the tea has a light flavor without a strong after-taste. Recommendation : If you want a strong mint flavor, look elsewhere. If you like an assortment of weak mint flavors, this tea is worth a try.